Y’all know I love eggs. And a while back I discovered that I really like green chiles with eggs. 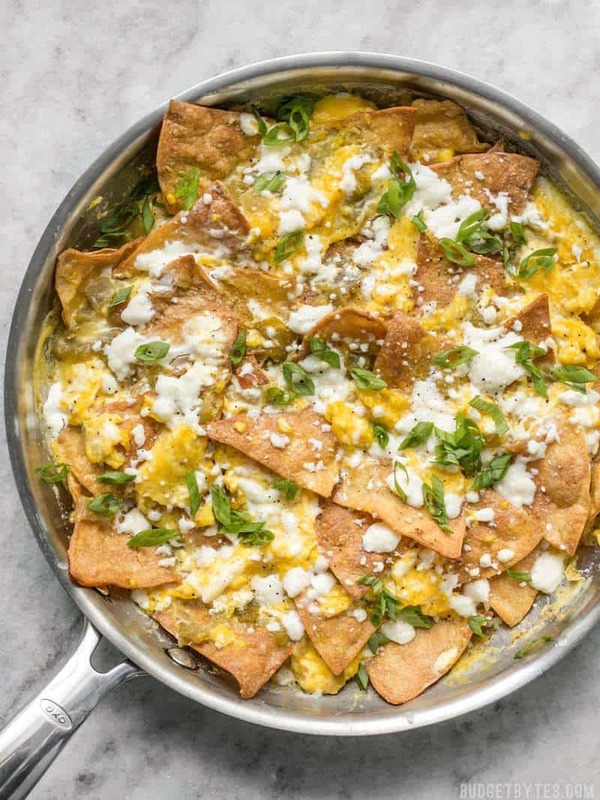 So today I made this Green Chile Migas, which is basically a scrambled egg dish with crispy tortillas, cheese, and some other goodies mixed in. It’s like scrambled eggs on steroids. I did things a little differently than traditional migas, most notably my tortillas were baked, not fried (I have a great fear of deep frying). But since the chips are lightly coated in oil before they go into the oven, they almost get a fry-lite action going. They come out beautifully crispy and crunchy without any oil splatter. I also ended up popping the entire skillet into the oven for a few minutes at the end, but if you don’t have an oven safe skillet or just don’t want to do that extra step, you can keep it all on the stove top if you prefer. I’ll put directions for both in the recipe below! Get ready for your new favorite way to eat scrambled eggs. 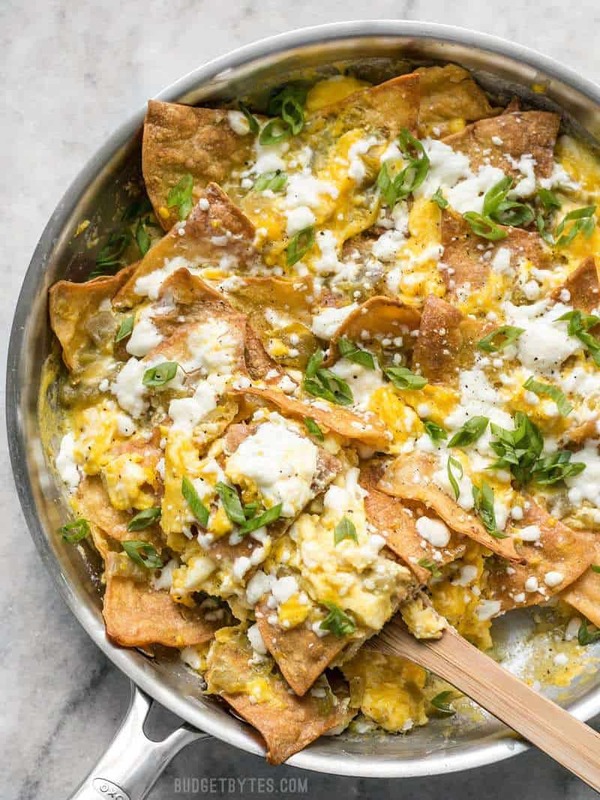 Green Chile Migas is a fast and inexpensive egg dish that is flavorful and filling any time of day, not just for breakfast! Preheat the oven to 400ºF. 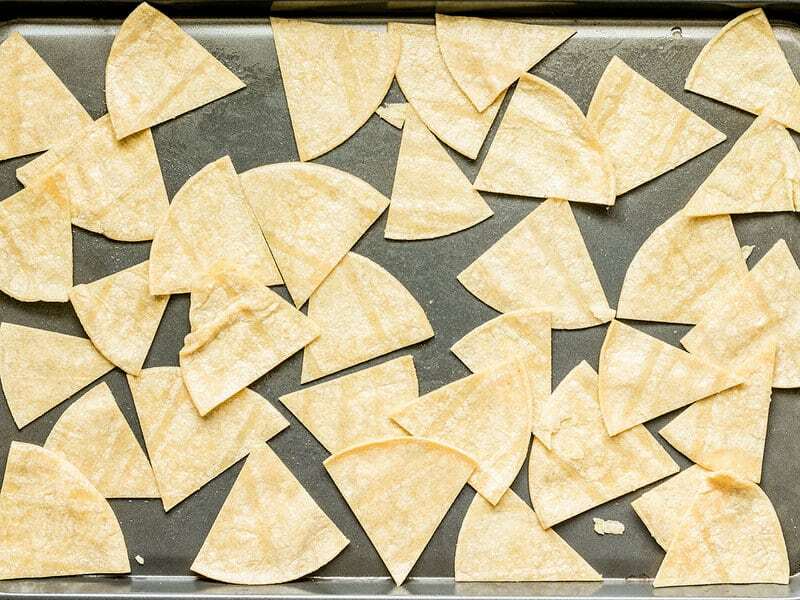 Stack the tortillas and then cut them into six equal sized wedges. Place the tortilla wedges in a bowl and drizzle the cooking oil over top. Gently toss the tortillas until they are well coated in oil. 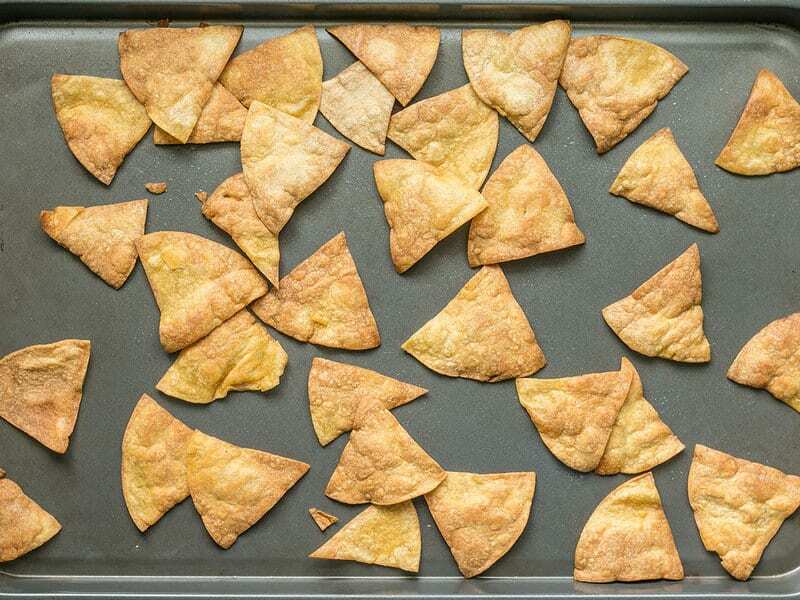 Spread the oil coated tortilla triangles out over a baking sheet in a single layer. Bake the tortillas for 8-10 minutes, stirring once half way through, or until they are golden brown and crispy. Leave the oven turned on. While the tortillas are baking, prepare the other ingredients. 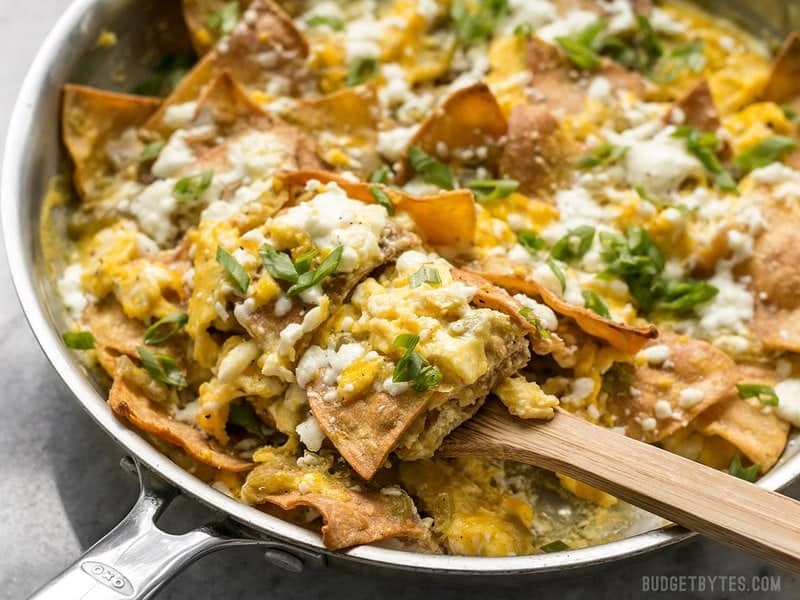 Lightly whisk the eggs, drain the can of green chiles, measure the sour cream, and slice the green onions. Also gather 2 Tbsp butter and 2 oz. queso fresco or shredded Monterey jack cheese. Add the butter to a large skillet and heat over medium, or just below medium. Allow the butter to melt, then swirl the skillet to coat the bottom and around the edges. 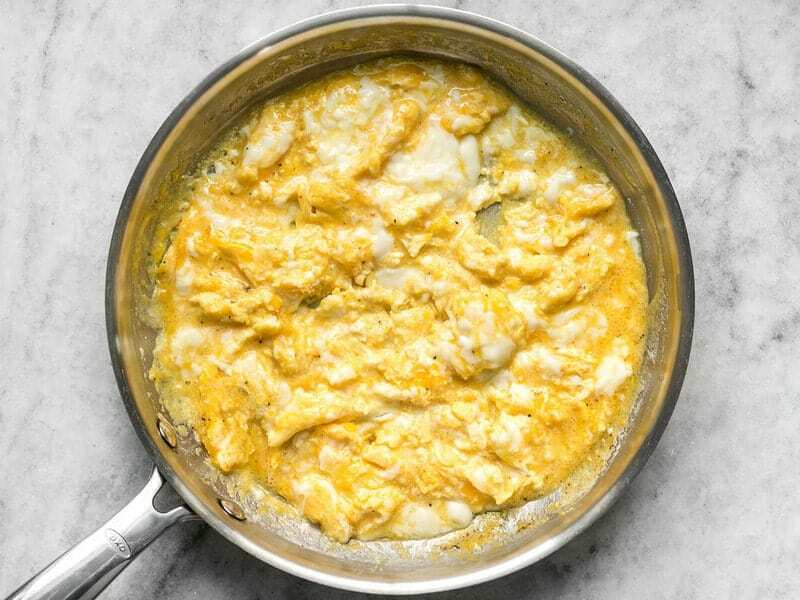 Pour the eggs into the hot skillet and gently scramble the eggs until they are about 60% solid (if you want to skip the oven and cook it all on the stove top, cook the eggs until they are about 85-90% solid). Season the eggs with a pinch of salt and pepper. Take the eggs off the heat and spoon the green chiles over the surface. Add the sour cream in dollops all over the eggs. 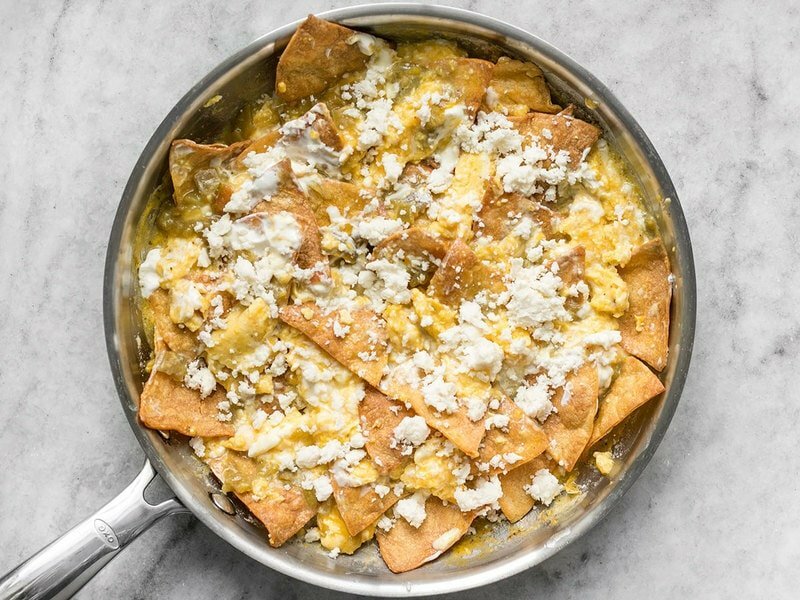 Add the baked tortilla chips and then gently fold them into the eggs so they are half covered beneath the eggs. Finally, crumble the queso fresco or sprinkle shredded Monterey jack over top. Transfer the skillet to the oven (still set to 400ºF) and bake for 5-8 minutes, or until the eggs are set and the cheese is melted. If cooking entirely on the stove top, place a lid on the skillet and place it over medium heat until the egg are fully set and the cheese is melted. Sprinkle sliced green onions over top just before serving. Preheat the oven to 400ºF. Stack six small corn tortillas and then cut them into six equal sized wedges. Place the wedges in a bowl and drizzle 1/2 Tbsp cooking oil over top. Gently toss the triangles until they’re all coated in oil. Spread them out over a baking sheet in a single layer. Bake the chips for 8-10 minutes, stirring once about half way through, until they are golden brown and crispy. If you want to bake the eggs at the end, leave the oven on. If you want to cook this all on the stove top, you can turn the oven off. While the chips are baking, get the rest of the ingredients ready. You’ll need 2 Tbsp butter, 8 larg eggs lightly whisked, one 4oz. can of diced green chiles (drained if there is a lot of liquid in the can), 2 oz. 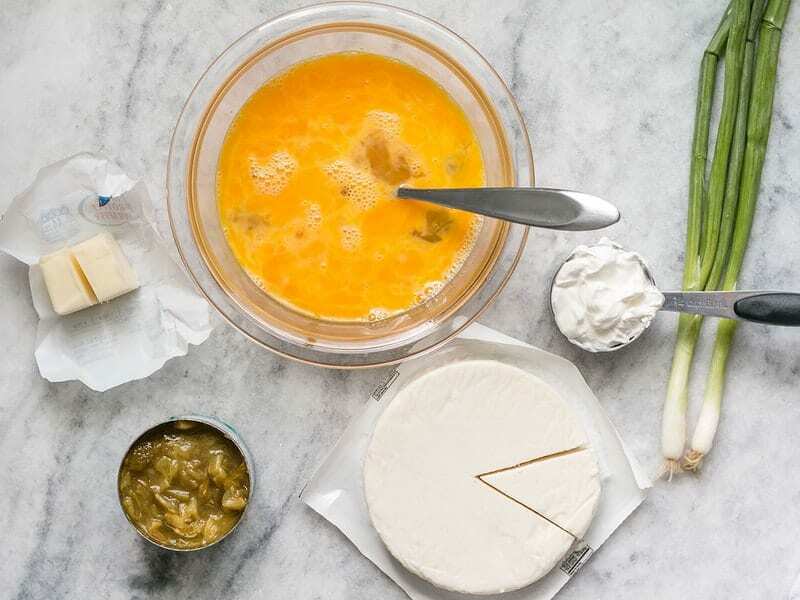 queso fresco or shredded Monterey jack cheese, 1/4 cup sour cream, and 2 green onions (sliced). Add 2 Tbsp butter to a large skillet and place it over medium heat (or just below medium). Allow the butter to melt, then tilt the skillet to swirl the butter over the surface and around the sides of the skillet. Pour the eggs into the skillet and gently scramble the eggs until they are about 60% set (if you want to do this all on the stove top, cook until 85-90% set). Remove the eggs from the heat and season the eggs with a pinch of salt and pepper. 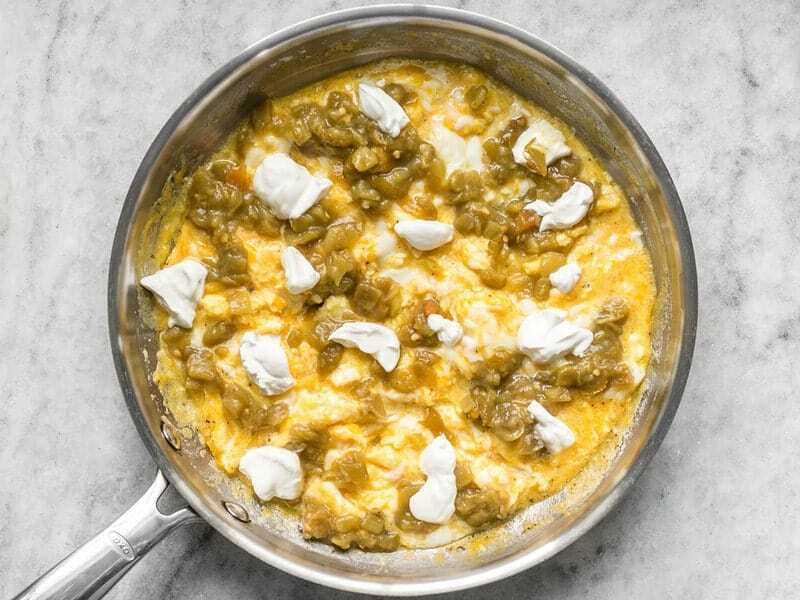 Spoon the green chiles over the eggs and drop the sour cream in small dollops all over the surface. 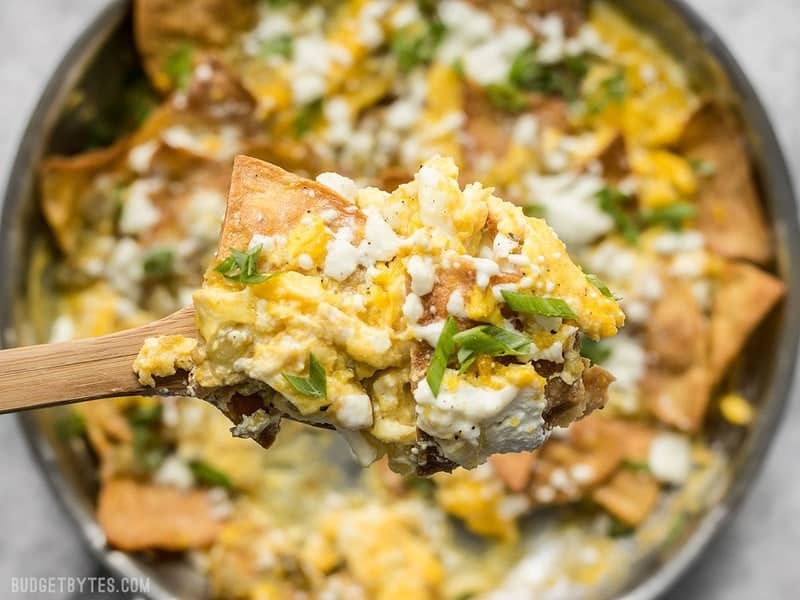 Add the baked tortilla chips to the skillet and fold them into the eggs so they are about half covered. Crumble the queso fresco over top, or sprinkle shredded Monterey jack cheese on top. Place the skillet back into the hot oven for 5-8 minutes, or until the eggs are set and the cheese is melted. OR place a lid on the skillet and place it back over medium heat and let it cook until the eggs are set and the cheese is melted. 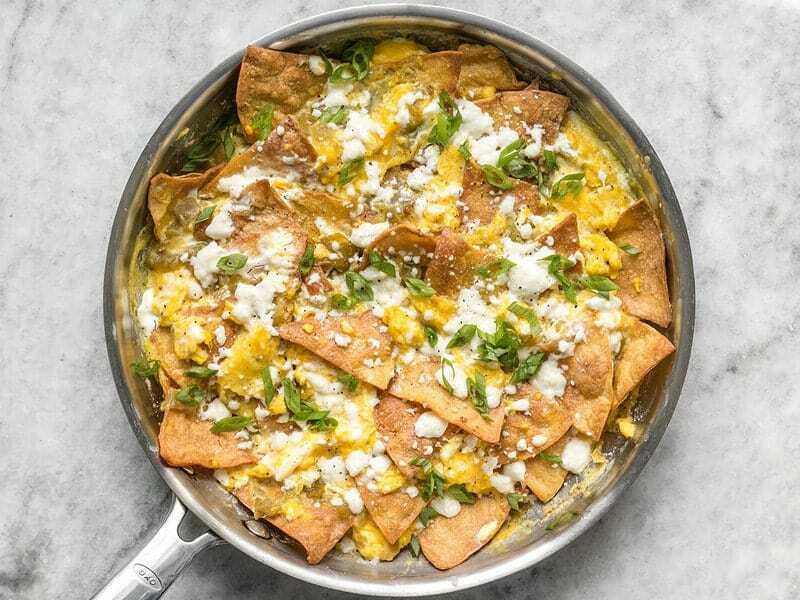 Once fully cooked, sprinkle sliced green onions over the Green Chile Migas and serve! Love it! 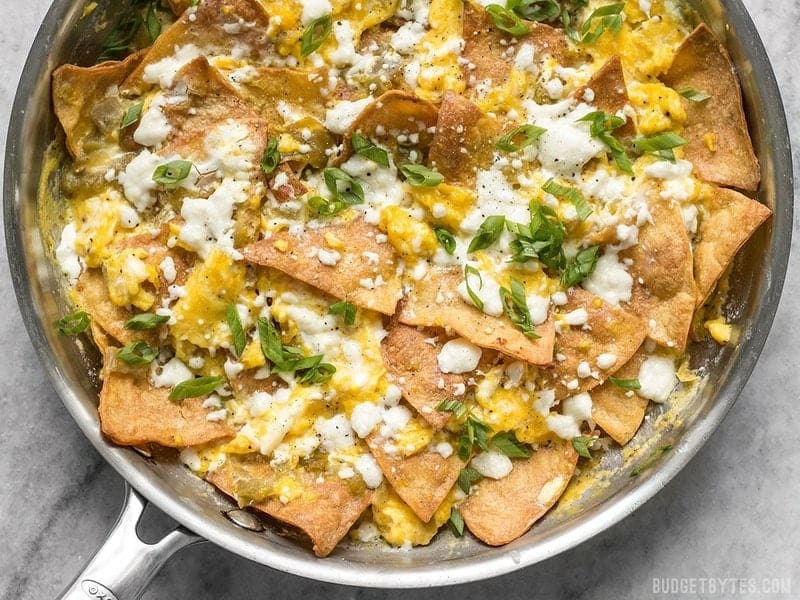 Such a delicious and easy brunch to use up leftovers from Mexican recipes. Tastes absolutely fantastic for a brunch. You can make it with whatever you want; I used some regular salsa instead of green chiles and it was fabulous.